Hands on: HEOS by Denon wireless multi-room system review | What Hi-Fi? Multi-room audio has been a real sector of growth over the past 12-18 months. From Kickstarter campaigns from the likes of Musaic and Bluesound HD to big name propositions from Samsung and Panasonic, it seems Sonos may soon have serious competition on its hands in a market it once had all to itself. The newest brand to throw its name into the multi-room hat is Denon with its HEOS by Denon system. Coming from a company with a history so steeped in hi-fi, we couldn't turn down the opportunity to go and get a demo of the new system at the European Dealer Conference in Marbella this week. HEOS by Denon – what is it? The HEOS by Denon system is currently made up of six parts - three speakers, the HEOS 3, 5 and 7, the HEOS Amp, HEOS Link pre-amp and the HEOS Extend wi-fi extender. The HEOS 3 is the baby of the family. Rather like Sonos’s Play: 3 and Play: 1, it can be used both horizontally and vertically, and can be paired with another HEOS 3 to make a stereo pair. It packs dual custom full-range drivers and a two-channel digital amp, and will set you back £249, the same cost as its Sonos rival. A little bigger is the HEOS 5, which has a carrying handle for easy manoeuvring around the house. It features four dedicated class D amplifiers, two custom-designed tweeters, two mid-range drivers and a passive radiator. UK pricing for this will be £349. Finally, the big brother family is the HEOS 7, which packs some serious power thanks to its subwoofer, two full-range drivers, two tweeters and two passive radiators, the resulting combination of which will cost £499. The inputs on the back of all three remain the same across the range, with a single USB and aux in, plus an ethernet port for network hardwiring. The HEOS 7 also adds a 3.5mm jack on its side panel for headphone listening. The inclusion of an aux in here is used during set up (more on that later), but also opens up the speaker for use with devices offline as well as online – something Sonos has so far been hesitant to do on its full range. The USB input is a neat addition too – if you plug a drive filled with music into any one HEOS speaker on your network, any speaker on that network will then be able to access and play that content too. We’re quite taken with their look, and are really pleased to see Denon create its own identity for HEOS through its design. They’re striking without being too over the top, and we can imagine them slotting into most rooms without issue. They're well made too, and will be available in a choice of white as well as black. Sitting alongside the speakers are the HEOS Amp and HEOS Link, both of which offer interesting propositions. The HEOS Amp allows you to turn an existing setup into part of the HEOS system. Its speaker terminals mean you can hook up any speakers – we saw it connected to some Polk Audio floorstanders – while its optical-in also gives you the opportunity to connect your TV and have that audio streamed throughout the house. There’s also a USB-in for connecting things such as active speakers, a subwoofer-out for adding some low-end punch and a 3.5mm input. The HEOS Amp will cost £399 in the UK. Moving on to the Link, we saw this little pre-amp hooked up to a record player and a Denon stereo amp – so you can play the music from your record player, or whatever you’d like to connect, throughout your entire house. Just as with any other wireless multi-room system, you’re going to need to download an app to get started, and then to control your speakers and music. The HEOS app will be available for Android and iOS, and will be free to download. Denon has put a lot of emphasis on simplicity with HEOS, and from the set up we saw we’re not sure it could get much simpler. You can either set it up with a network cable for a no-questions-asked connection in seconds, or use the included 3.5mm cable to connect the HEOS speaker to your tablet or smartphone to get it on to your home network. Once it notices a speaker is attached, the app will show you a visual guide to help you to get your first speaker on to your network in around three steps and a couple of minutes. Once the first is set up, any other speakers you have are able to copy the details from the original one wirelessly. There are no displays on any of the speakers, but there is a coloured LED on each unit that will show different light sequences bases on its status – a solid blue light, for example, shows that it is connected. This level of simplicity carries on throughout the app, which is based around three main icons at the bottom of the screen at all times – Rooms, Music and Now Playing. The Rooms tab allows you to see all the speakers on your network (and what they’re playing), lets you rename them for easier differentiation and also group them together so they’re singing from the same hymn sheet. That’s a simple drag and drop experience, with the top speaker of the group taking the lead on the music. For a quick fix for the whole house, the “Pinch to Play” feature allows you to perform a pinch gesture on the screen to include all speakers in the musical action, up to a maximum of eight. The Music section feels like the app’s main homescreen. It lists the streaming services you can use, music available locally on your device and your network, a shortcut to stored playlists, a history of all music played, and direct access to any device connected to the aux in. You’re certainly not short of choices. You can add music to your music queue from any of these sources by simply selecting them and choosing where you want the track to be placed in the queue – you can choose to Play Next, Add to the End or clear the queue completely using Play Now & Replace. Any queue you’re particularly proud of is easily saved for quick revisiting by clicking the star icon at the top of your history page to turn it into a playlist, all stored in the cloud. Streaming services available at launch will include TuneIn Radio, Spotify, Pandora, Deezer, Napster and Rhapsody, with quarterly software updates expected to add new services every three months. You are also able customise which of these services show in the Music tab so you see only those services you use. A noticeable difference for Spotify users on HEOS compared to Sonos is that HEOS uses Spotify Connect, so you'll get the full Spotify experience that you'll be used to, including radio stations, curated playlists and recommended music. Now Playing is simply where you can go to view what’s being played, as well as control the volume and view the music queue. If the speaker is tied in with any other in a group, you’re able to tweak their volumes individually should you wish, and a master volume slider will then adjust all of them together, keeping the volume ratios the same between them. You will need to create a HEOS account before you play any music, but this allows multiple family members to use the speakers and have access to their own playlists and history, along with all your log in credentials for the streaming services. You can dig deeper in the app to find a few more features in settings, including the ability to allow music sharing from your device. This means other devices on the same network will be able to access your music for playback via HEOS – particularly handy if you have your music collection stored across several devices. But while there are plenty of great features, there are some that might require some extra thought, such as the ‘Everyone is a DJ’ feature. This allows anyone on the same network to control the music queue that is currently playing, adding in music and altering the playlist, with the aim of it being a collaborative musical experience. That’s all well and good, but an option to disable it for certain circumstances would be good – especially if you’ve got mates who might just stitch you up with an Atomic Kitten medley right in the middle of your uber-cool indie playlist. Denon has chosen to operate the HEOS system using your wireless home network, rather than using a proprietary system like Sonos' 'Mesh' network. It’s certainly a worry for people whose home wi-fi is on the weak side, but Denon has remained confident that HEOS's ability to work on both 2.4Ghz and 5Ghz wi-fi bandwidths will mean it can provide a stable enough connection that playback will never be interrupted. Still concerned? Denon has that covered too with the HEOS Extend, a £79 wi-fi extender that will help to improve your network’s reach throughout your home. HEOS by Denon – how does it sound? First impressions are very good indeed. The HEOS 7 is a seriously powerful speaker that’s capable of some real volume and impressive bass weight, thanks to that subwoofer. Our demo was in a large room with high ceilings, and it never sounded lost or out of its depth at any point. That said, the HEOS 5, while not quite capable of the same low-end rumble, sounds pretty substantial too, and we’d say would still fill most rooms in the house without issue. The HEOS 3 is more suited for smaller rooms, and when paired in stereo mode, offers a cohesive, convincing stereo effect. Group them all together and the result was really quite something, with no hint of delay, and all speakers playing completely in unison. We’ll withhold any further judgement until we get them into our listening rooms, but from our short time with them, we really can’t wait until we do. HEOS by Denon – what’s next? If all that sounds pretty exciting, it’s only the beginning. Denon gave us a hint at what's next for HEOS, with Bluetooth not dismissed as a potential future inclusion and the range extending to include a soundbar, soundbase, subwoofer and smaller wireless portable speaker, called the HEOS 1. Quite the line up indeed. Until then, we have until August time to wait for the current HEOS system to hit the shops. 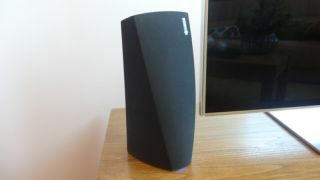 From what we’ve seen, it has to be one of the most well-equipped contenders to take on Sonos at the game it knows so well. It’s similarly priced, equally stylish, wonderfully simple to use and includes a few great features that, as yet, Sonos has overlooked. The multi-room market just got very exciting indeed.